Edward Scicluna is fighting for his political skin. His article in today’s Times of Malta is an attempt at survival by resorting to some classic right-wing Labour rhetoric of ‘my country right or wrong’. It took him some time to say it because of the residual embarrassment that comes with education and the majority of one’s life spent outside politics. But he’s now been persuaded to say the European Banking Authority, the most senior regulator of the third largest regulated banking space on the planet, is acting on the instructions of David Casa. No doubt he thinks this is ridiculous, but he’s been persuaded that in the country of Dom Mintoff he can get away with it. And he will. He also tries to get away with the fact that his predecessor Tonio Fenech had had a meeting with Ali Sadr and he had not. Facts are facts. As are the facts Edward Scicluna does not mention. His boss, Joseph Muscat, also met Ali Sadr. He was proper buddies with him and flew to Italy to attend his wedding. Ali Sadr was licensed to bank by Edward Scicluna’s Ministry. Edward Scicluna received Ali Sadr’s very first application, processed it and granted it. Daphne Caruana Galizia reported on the crimes happening at Pilatus Bank. Edward Scicluna ignored those reports. For a year. He accused FIAU investigators of writing reports on Pilatus Bank ‘to be leaked’, and a week later he oversaw their dismissal from work. Right up to the arrest of Ali Sadr by the US Federal Authorities he stood in Parliament to defend Ali Sadr’s bank saying there was no reason to believe anything untoward happened. Until of course it turned out it had. Edward Scicluna gives the lame excuse this was just one bank, a lonely rotten apple. That’s just the one we know about because Daphne Caruana Galizia was still around then. It’s also one that was allowed to commit its crimes because it handled illicit money for Keith Schembri and Joseph Muscat’s wife. As Edward Scicluna says, look at all the coverage in the world press, the investigations by US and EU bodies, the report of the EBA, and you can all trace them to one source. And that source is in Malta. The source is the Panama Gang led by Joseph Muscat and aided and abetted by Edward Scicluna who today pleas an Adolf Eichmann defence arguing that whatever may have happened he got the trains to run on time, and no one would have known about the ovens if the Germans won the war. In his case, he lists all the anti-money laundering conferences his staff went to and all the legal amendments he tabled in Parliament. 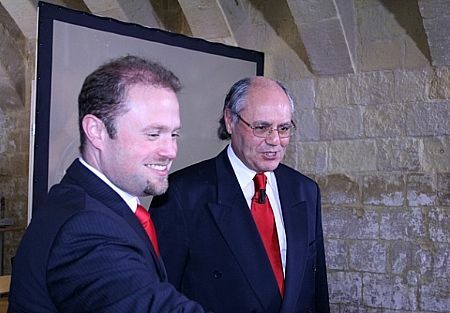 No one would have known those laws were being intentionally ignored to allow Pilatus Bank to launder money for international crime syndicates and the crooks that took over our country if Daphne Caruana Galizia did not get herself killed digging this minefield. Fine, Edward Scicluna, ignore the calls for your resignation. Ignore the findings of the European Banking Authority and attribute them to the powers of David Casa. Ignore the decency and self-respect you have left outside the doors of your Ministry. Stay in power just because you can. Facts are facts though. And you have used your supposed erudition and cashed your schooling to bring the country’s name to disrepute all over the world. And like a child, you try to pin your faults on David Casa.